For the past few years, most of the jokes in the sports-gaming universe have seemed to center around the NBA Live series. Those jabs have been fair, to say the least, as the series saw a massive change of direction of the high-performing NBA Live 09 & NBA Live 10 that lead to multiple titles being cancelled. While there were quite a few sports titles showcased at E3 this year, NBA Live 14 was one of the highest on my radar. Kyrie Irving’s character model, showcased during the EA press briefing, seemed to be too far from in-game graphics, so getting my hands on a playable build of the game was sure to help me gauge the current status of the game. The focus of the press briefing, BounceTek, was also the focus of what we saw behind closed doors. The playable build we had our hands on featured Kyrie Irving in a gym by himself. Visually, the game looks fantastic. 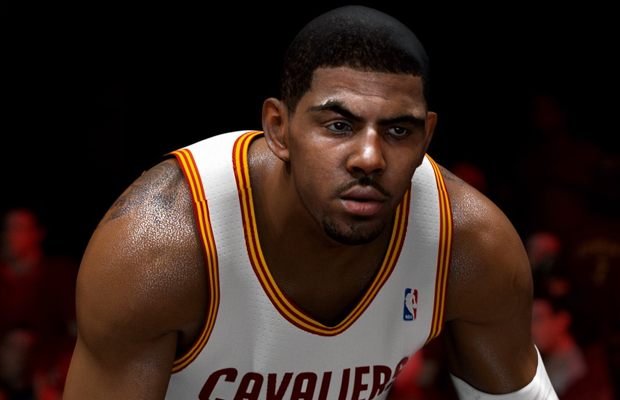 There was an incredible amount of detail in Irving’s model–especially in his face–and the build of the player was a large improvement over typical NBA Live models. Similarly, the dribbling animations were incredibly fluid; using the L1 button on the Playstation 4 controller allowed us to tap into Irving’s six signature moves. BounceTek is all about bringing a physics-based dribbling system to the virtual hardwood, something we’ve never seen before. You’re able to let a move play all the way out, or break out of it and chain together your own moves. Rather than letting your opponent see the initiation of a move and know where you’re going, you’re potentially able to see how they’re playing you and use that to your advantage. We were told that the game currently has 40 players with signature dribbling moves, and the team is hoping to add more as they near launch. BounceTek should really help separate the average from the elite players, but we should also see differential between players like Rose, Westbrook, and Parker. The dribbling mechanic works great solo, but the true test will be once we see a defender thrown into the mix, and eventually five-on-five. The purpose of dribbling is to set up plays for your teammates, evade pressure, or to create a shot. While we were able to see the basic functionality and fluidity of the feature, we’re itching to see how it works when defenders are thrown into the mix. To add some hope for the defensive and team aspects of the game, EA SPORTS also announced CourtQ. Seeming rather similar to the “Synergy” technology we saw in previous NBA Live titles, the system will allow players and teams to perform almost identical to their real-life counterparts. From moves to offensive sets, CourtQ looks to be the answer to finally having realistic AI in a basketball game. The Ignite engine and BounceTek have set up NBA Live 14 to succeed, but we’re cautiously optimistic at this point. What we played felt great, but until we see the game running five-on-five, we can’t help but wonder how it’ll all work together.